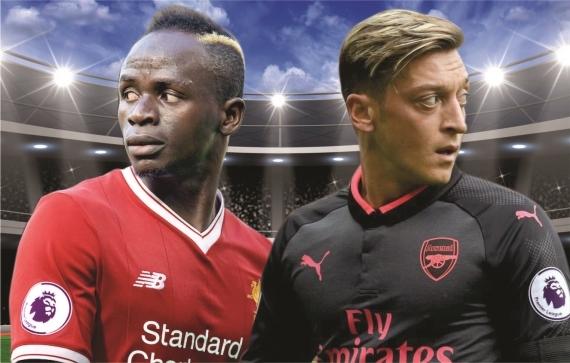 Liverpool host Arsenal at Anfield in a Super Sunday humdinger. Whose your money on? Liverpool’s record against England’s biggest clubs will be put to the test once again when they host Arsenal this Sunday. The Reds dominated this fixture last season, winning at both the Emirates Stadium and at Anfield – a feat they hadn’t achieved since the 1999/2000 campaign. Both clubs’ top player have made headlines in recent weeks, with Philippe Coutinho submitting a transfer request, while Alexis Sanchez has been linked with a move to some of the biggest names in Europe. From the top six sides, these two clubs have arguably the weakest defences, but at the same time, are a joy to watch going forward. If recent results are anything to go by, then we should be in for a cracking encounter! Liverpool, who are undefeated in their opening two matches, will look to continue their impressive run against the big guns, after going undefeated against their surrounding title rivals last season. Jurgen Klopp’s men have an UEFA Champions League tie in midweek against Hoffenheim, after completing half the job in Germany, winning 2-1. Fatigue could play a huge role in their match against Arsenal, and with Philippe Coutinho out with a “back injury”, Adam Lallana sidelined with a thigh injury and Nathaniel Clyne also out with a muscular problem, the Reds are a bit short for numbers. One player that never shows a sign of fatigue is Sadio Mane. The Senegalese forward can run for days and days. He’s terrorised the Arsenal backline before, and he sure as hell could do it again. Mane is Liverpool’s key player at the moment and Klopp had high praise for the pacey talisman. “Sadio made a decision at the end which is very important. He’s there in those situations,” Klopp said after Mane’s winning goal against Crystal Palace last weekend. “He’s a striker, he scores goals – you need to have the nose for these situations. It’s not the same goal but it was a little bit like the Everton goal at Goodison, where he was quickest in the mind. “Everyone thinks about how quick he is with his legs and that’s true, but he’s quick in mind, that’s maybe the more impressive skill,” he concluded. It’s safe to say that the Reds are almost complete now. The left-back department finally could be solved after Andrew Robertson’s impressive debut for Liverpool. It’s still early days for the young Scot in Liverpool colours, but judging by that game, he seems the real deal. Liverpool are among the greatest teams to watch in England, and if Arsenal show any signs of weakness, the Reds will pounce! Arsenal have been off to their usual mediocre start to the season as they suffered their first defeat in just their second league game, losing 1-0 to Stoke City. Take nothing away from the Potters, they were brilliant, but it’s these sort of games that the Gunners need to be winning if they are to mount a title challenge. Arsene Wenger will be glad to welcome back Alexis Sanchez for this clash, while Laurent Koscielny also returns after serving his ban. Speaking on Sanchez, Wenger said: “He's not played now for six weeks and it's difficult to be at your best in the first game straight away." That seems like the perfect thing to say to a player who has been out for a while, but Sanchez is much different. He’s performed superbly in Arsenal colours while being injured in the past and he could certainly do so again this weekend. Koscielny will also be a huge boost for the Gunners in defence. Arsenal fielded two left-backs in their three-man defence last weekend against Stoke, with Shkodran Mustafi being the only out-and-out centre-back on the pitch. Alexandre Lacazette, who has been impressive since making his debut for Arsenal, will be looking to add to his goal tally of just one for the season, after his powerful strike was wrongfully ruled out as offside last weekend. It will also be exciting to see how he links up with Sanchez, as well as Mesut Ozil. The German playmaker has been accused of going missing in the big games, but with both Lacazette and Sanchez featuring alongside him, one gets the feeling that it could bring the best out of him. Liverpool defended brilliantly against Crystal Palace last weekend, but with all due respect, Arsenal are not Palace. Mignolet; Gomez, Matip, Klavan, Robertson; Milner, Henderson, Wijnaldum; Salah, Firmino, Mane. Cech; Mustafi, Koscielny, Monreal; Oxlade-Chamberlain, Ramsey, Xhaka, Kolasinac; Ozil, Sanchez; Lacazette. Knowing Liverpool’s record against the top sides in England, and with the fact that they are playing at Anfield, I cannot see the Reds losing this one. Although, it won’t be so straightforward with Sanchez and Koscielny now back for Arsenal. The Reds have kept just one clean sheet against Arsenal in their last 12 meetings, and for that reason, I’m backing them on the Win/Draw Double Chance & Both Teams to Score at even money.